Fingerstyle guitar player and Youtube phenom, Andy McKee, returned to the Washington, DC area on Friday night to play a fine concert of his original material for solo acoustic guitar. 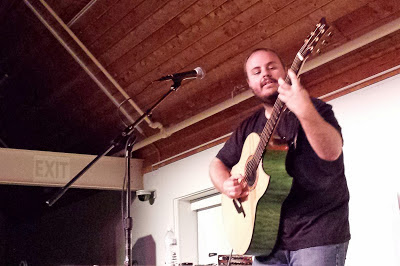 Andy acknowledged his debt to ground breaking guitarist Michael Hedges and played a spot on cover of the late Mr. Hedges The Layover. Andy was in good humor and played a comprehensive set of mostly original songs from all of his albums including his breakthrough Art of Motion and the most recent Joyland. As I told Andy after the show, it is my opinion that he most embodies the legacy of Mr. Hedges. For me, it is not just about technique but the structure and flow of his music which tells a compelling story. Opening for Mr. McKee was the very gifted Craig D'Andrea. He presented a very nice set of instrumental pieces for acoustic guitar that were varied and engaging. Craig also records for Candyrat Records which has a fine stable of acoustic guitar practitioners. Label mate, Don Ross, will be making a stop at Jammin' Java in June.